September is a great month to visit the North Myrtle Beach area since schools will be back in session. What better way to start up the fall than to attend a fun beach party at our resort! This year come visit Avista Resort and stay in one of our oceanfront condos while coming for one of the biggest beach parties around. Our 2018 SOS Fall Migration happens to be September 14-23rd and it’s to be one of the parties where thousands come to the coast to celebrate the Carolina Shag Dance! Let’s take a look at the schedule below! No Entertainment by the pool but there will be bands on Main Street for you to enjoy. No entertainment by the pool but bands will be on Main Street for you to go and enjoy. 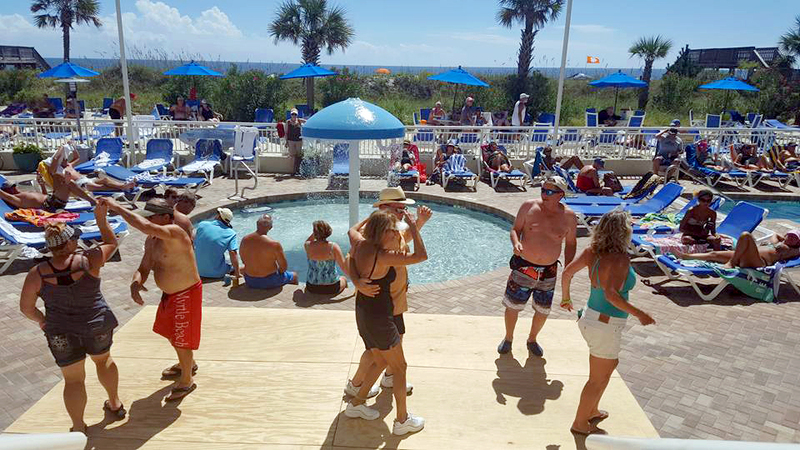 Our pool decks and even poolside beach will become dance floors for you to enjoy some good Carolina Shagging. Plus, when you stay in one of our condos, you will be just minutes away from the other fun in North Myrtle Beach. Avista Resort is about a 5-minute walk from the SOS beach clubs, entertainment and restaurants of Main Street. We offer you spacious 1, 2, and 3-bedroom condos with fully equipped kitchens and even private balconies where you can sit and enjoy some of the music there. Don’t let this moment pass you by and come and get in on the fun this year. We can’t wait to see you and let the good times roll! Previous PostPrevious Avista Resort Rated #1 on TripAdvisor for North Myrtle Beach Hotels!